If a major eruption were to occur in Öræfajökull, this could paralyse all air traffic across Europe for days on end, according to a research group at the University of Iceland. The research team was led by Dr. Uta Reichardt, a recent Doctoral graduate of the university’s Environment and Natural Resources program who has been studying the impact of volcanic eruptions on the aviation sector in Europe. Öræfajökull is an ice-covered volcano in South East Iceland and lies within the Vatnajökull national park and is covered by the glacier. Öræfajökull has erupted twice in historical times, in 1362 and in 1728. The eruption in 1362 caused the distruction of a district known as Litla-Hérað and volcanic ash travelled as far as to western Europe. More than 40 years passed before people settled in the area once again, an area now known as Öræfi which means wasteland. 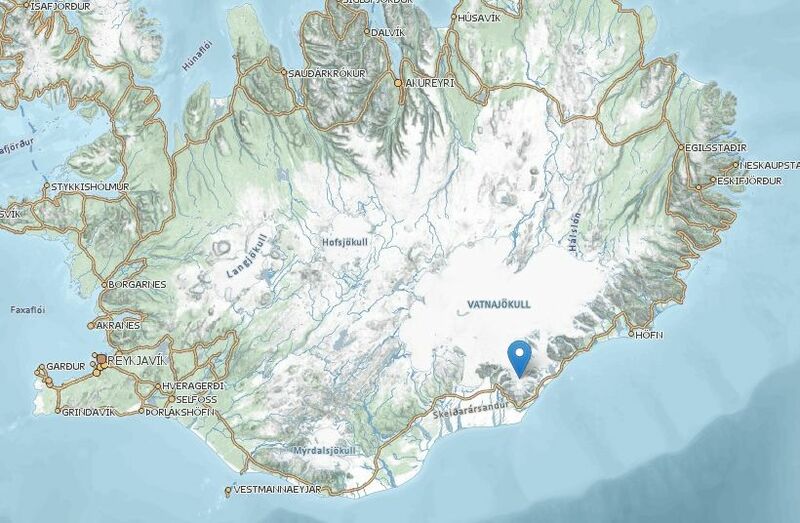 There are no signs of an imminent eruption, but it is close to ten months since an unrest in Öræfajökull was detected. The unrest was apparent from elevated seismicity, the development of a depression in the ice-surface (cauldron) within the caldera, and the presence of geothermal gases from a glacial river. At this time, the geothermal activity beneath Öræfajökull was assessed to be high relative to previous decades. According to the Iceland Met Office, the level of earthquake activity at Öræfajökull has been stable for the last months, with signs that the earthquakes are becoming smaller with time. Hydrological and geochemical measurements show stable values. Measurements in late March indicate that the geothermal heat output beneath the cauldron has diminished significantly from what is was when the cauldron formed. 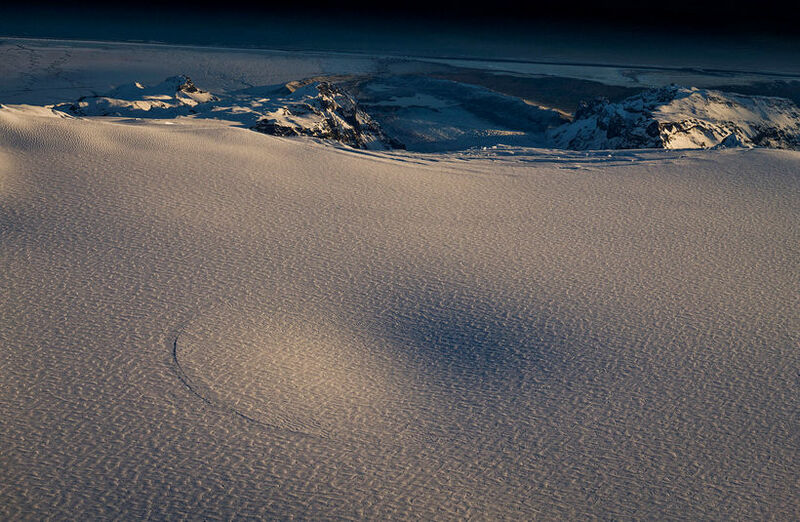 There is a possible small, ongoing inflation signal in Öræfajökull, however, there are no signs of an imminent eruption. As that behaviour was above known background conditions, it could potentially indicate increased risk of eruptive activity that could affect air traffic. Consequently, the Icelandic Meteorological Office raised the Aviation Color Code for Öræfajökull from Green to Yellow. At the same time, the Icelandic Civil Protection and Emergency Management raised their alert level to Uncertainty phase. 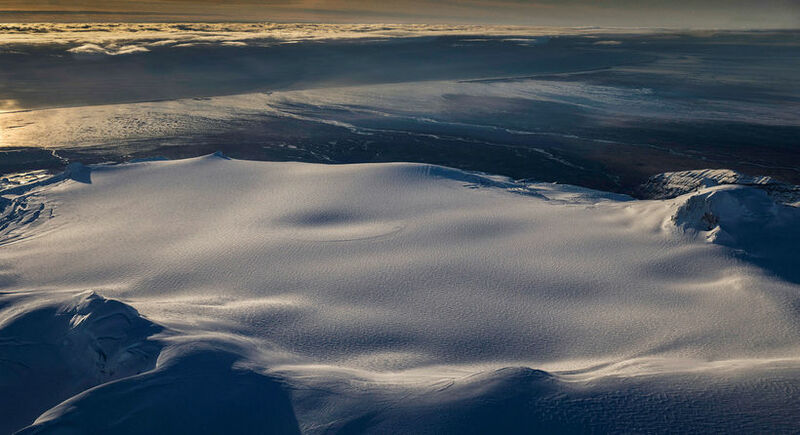 The uncertainty phase declared by the Iceland Civil Protection and Emergency management remains in force but it is assessed that Öræfajökull volcano is currently not posing an imminent hazard to aviation. Hence, the Aviation colour code was downgraded from Yellow to Green. The Eyjafjallajökull eruption in April 2010 was not a particularly sizable one by Icelandic standards, but it nevertheless wreaked international havoc. The ash plume emitted by the volcano, combined with unfavourable weather conditions and strict precautionary regulations at the time, halted air traffic in Europe for several days and prevented millions of passengers, as well as commercial goods, from reaching their destinations. The eruption led to the greatest disruption of air traffic since World War II and caused an estimated worldwide loss of US $5 billion with over 100,000 flights cancelled. As part of the larger research projects ENHANCE and NORDRESS, Dr. Reichardt’s research group focused on how the European aviation sector has amended its procedures with regard to volcanic ash since the eruption in 2010. The research group formulated two eruption scenarios based on historical events to predict possible impacts of eruptions larger than the one that occurred in Eyjafjallajökull. Both scenarios were modelled around the weather conditions from the 2010 eruption. Dr. Reichardt then conducted expert interviews and organised a stakeholder workshop to simulate aviation sector responses to the scenarios and to facilitate discussion about how to improve such responses. The researchers analysed the cooperation and information exchange between the actors and institutions that aim to mitigate impacts of ash on air travel. 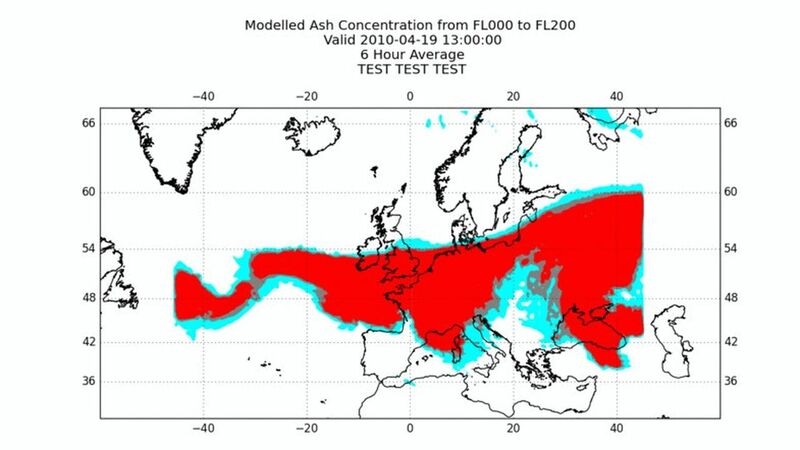 The NAME model, an ash dispersion model used by the London Volcanic Ash Advisory Centre, was used to simulate the ash clouds in the eruption scenarios. 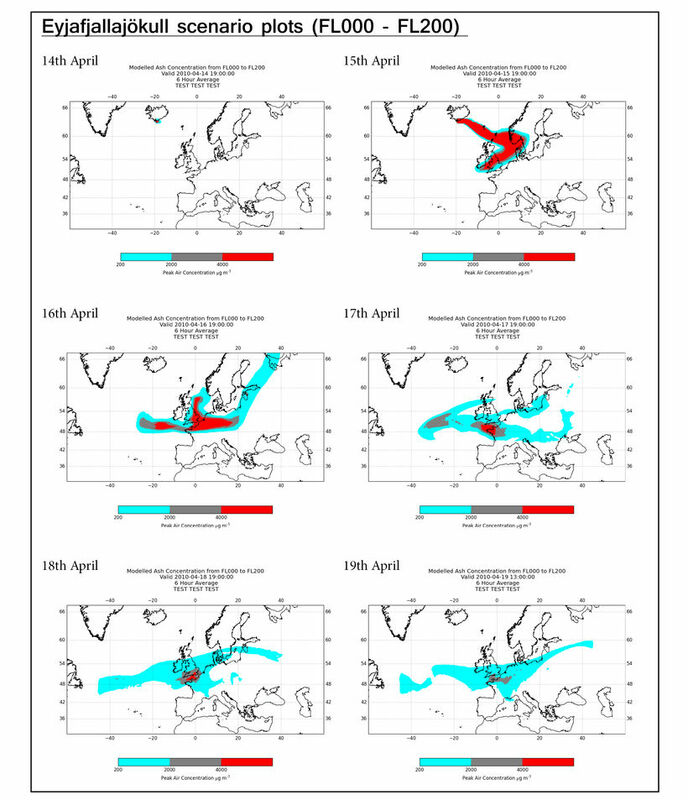 The accompanying animations show the development and distribution of the modelled ash clouds over the five days following the eruptions. The first scenario describes recurring eruptions of the Eyjafjallajökull volcano with an ash volume similar to the event in 2010, but assumes a total eruption time of six months, four times longer than in 2010. Eruptions of this duration are feasible, as Dr. Reichardt points out: the recent eruption in Holuhraun, which began in late summer 2014, continued for six months. Prior to 2010, the most recent eruption of Eyjafjallajökull began in 1821 and continued until January 1823, or nearly 14 months. Animation 1: The Eyjafjallajökull eruption scenario. Twenty-four hours into the eruption, high ash concentrations are forecasted to have reached the London airspace as well as parts of Norway, Sweden and Denmark. Over the course of the following days, the air masses travel further south spanning from Western to Eastern Europe. While high ash concentrations slowly decrease, a broad band of air with low ash concentrations of 200&#8211;2000 µg/m³ is forecasted 5 days into the eruption up to approximately 6 km height. The second scenario, an eruption in Öræfajökull, is based on the volcano’s eruption in 1362, one of the largest eruptions in Iceland since the settlement. It describes a large ash emission over a rather short period of time to test the reactions of the stakeholders to a large-scale severe interruption of air traffic. The discussions in the workshop revealed that such an enormous ash eruption would paralyse air traffic in Europe. An eruption of this kind would affect flights at all altitudes and halt all air traffic for several days, with the total impact on air traffic as a result of cancellations and rescheduling continuing for 2–3 weeks. Furthermore, Dr Reichardt says that the effects of the eruption in this scenario could even reach across the North Atlantic. Not only would such an eruption affect air traffic, it would also impact maritime traffic, as records from the 1362 eruption indicate: the eruption caused a thick layer of pumice to collect on the surface of the ocean, and an event of this kind today could hinder shipping traffic and fishing. Animation 2: The Öræfajökull eruption scenario. Twenty-four hours into the eruption, high ash concentrations are forecasted to have reached Northern European countries. In the following days a large broad band of ash is forecasted over Europe, reaching far west over the Atlantic and far east towards Russia. 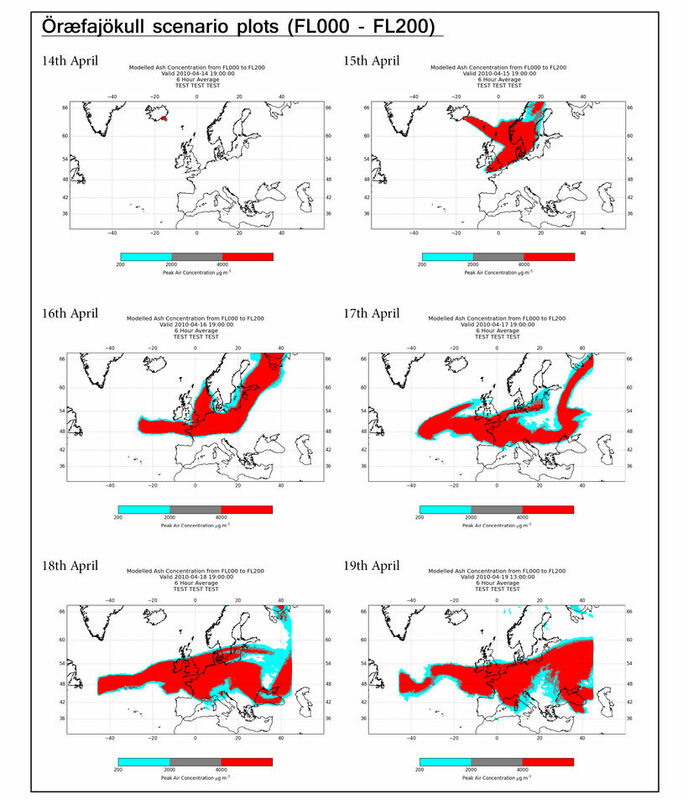 High ash concentrations of more than 4000 µg/m³ are predominant throughout the forecast period, up to 16 km and more. Dr. Reichardt’s study affirms that the infrastructure for coordinated responses to volcanic eruptions has now been established. There are designated teams within partner institutions—such as the crisis management unit at EUROCONTROL, the European Organisation for the Safety of Air Navigation—that are ready to perform during crises. International exercises such as the Volcanic Ash Exercise, or VOLCEX, are in place to practise procedures on an annual basis. The article was originally published in Morgunblaðið by journalist Guðni Einarsson. Translated and updated by Anna Margrét Björnsson.